(BOB DREBIN / isiphotos.com) Senior forward Bonnie Samuelson (left) led the Cardinal with 17 points against the Notre Dame Fighting Irish. She went 5-of-8 from three points range to end her career on the Farm. Despite a hard-fought effort, the No. 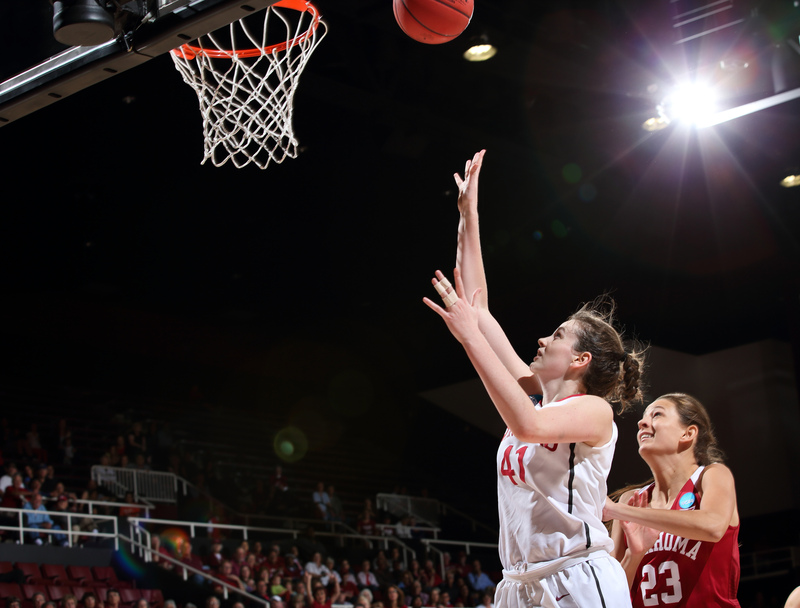 4 seeded Stanford women’s basketball team ended its season Friday evening with a 81-60 loss against No. 1 seeded Notre Dame in the regional semifinals of the NCAA tournament. Lindsay Allen and Jewell Loyd combined for 49 of the Irish’s 81 points to lead the team to victory. Allen, who prior to the matchup averaged just under 10 points per game, shot lights out in the first half, notching 24 points. Because Notre Dame has so many offensive weapons, the Cardinal initially looked to help off of Allen, focusing more on limiting Loyd and the Irish’s posts. As a result of this defensive strategy, Allen scored off of many open looks. 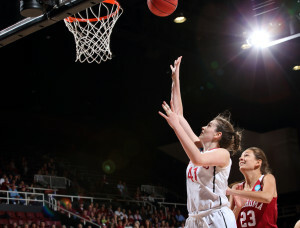 Although Stanford covered Allen better in the second half, during which she only scored 4 points, the damage had already been done. In addition, Loyd, one of the best players in all of women’s college basketball, bounced back from a quiet first half and scored 17 of her 21 points in the second period alone. Senior forward Bonnie Samuelson kept the Cardinal in the game for awhile due to her impressive three-point shooting. She went 5-of-8 from behind the arc and finished the game with 17 points. Senior guard Amber Orrange scored 8 of her 12 points in the second half, while sophomore forward Erica McCall earned a double-double (12 points and 10 rebounds) as well as 3 blocks. The Cardinal kept the game reasonably close for most of the first half. A three-pointer by Bonnie Samuelson with 3:15 to go before halftime put Stanford within 5 points of the Irish, who then proceeded to go on a 8-2 run to close the half, at which point Stanford faced an 11-point deficit. Early in the second half the score oscillated between single and double digits, with Notre Dame going up by as much as 13 and then seeing their lead reduced to as few as 4 after a layup by McCall with 14:49 left to play. But after the 8:50 mark, the Irish pulled away for good, sealing their victory and ensuring a matchup against Baylor in the regional finals on Sunday. To win the game, Stanford would have had to play exceptional defense to prevent the Irish from scoring as much as they typically do (81.1 points per game.) Additionally, VanDerveer would have needed her team to score more than its own average of 69.5 points per game to keep up with Notre Dame’s high-scoring offense. Ultimately, the Cardinal struggled to achieve both of those goals: Notre Dame’s offense rolled, thanks to stellar performances from Allen and Loyd, as well as contributions from forwards Taya Reimer and Brianna Turner (10 and 12 points, respectively). The Irish shot 49.2 percent overall, and 51.7 percent in the second half alone. “We worked pretty hard, but we did not play the type of defense that we needed to play,” said VanDerveer. On the offensive front, part of the team’s troubles can be attributed to Notre Dame’s shut-down defense, which forced 14 Cardinal turnovers. In addition, many players, such as Orrange, sophomore guard Briana Roberson, and sophomore guard Lili Thompson, did not shoot particularly well. Altogether, the team only notched 35.4 percent from the field on the night, and excluding Samuelson’s shooting, went 0-of-7 on three’s. “We just had a lot of people getting some real good looks that didn’t go down for us,” said VanDerveer. Sophomore guard Lili Thompson’s off night (she only shot 1-of-8 from their field) resulted from a knee injury in the first half, during which she played only 7 minutes before leaving the court. Although she came back in the game for 8 minutes in the second half, she did not play at her usual level and ended the game with only 2 points. While Friday’s loss ended Stanford’s season, the Cardinal kept their morale relatively high. After all, they have a lot to be proud of. From beating UConn in November (and likely being the only team to do so this season), to upsetting Oregon State on the road, to beating three talented teams to win the Pac-12 tournament title, and to advancing to the Sweet 16, this year’s women’s basketball team proved that, even without the Ogwumike sisters, they were a force to be reckoned with. The season also showcased great individual play and development from several players: seniors Orrange, Samuelson, and Taylor Greenfield played the best basketball of their collegiate careers over the past few weeks and months, while many underclassmen — McCall, Thompson, and sophomore guard Karlie Samuelson, for example — contributed on both ends of the court, indicating the potential for a strong team next season.